I f you are job hunting, there’s a service you may want to check out, if employment services and ads haven’t been working out (especially if they are leading you nowhere in your home town). Travel hostels—frequently packaged as “youth hostels” (“Youth” frequently guaranteeing drums-for-brains music in the lounge from dawn to dusk). Having just spent six months in hostels, BBs and hotels in China, Scotland, Ireland and England, I’ve seen how the average hostel serves as “job central” for adaptable job-seekers on the move, making moves or out of them and other resources, such as cash. Maintain essential job-hunter agility and mobility, without risky commitments to infrastructure, such as an apartment with a lease and furniture to buy. Time and again, I met people using hostels as their base for these purposes. There was Andrea, a 20-something Sicilian who moved to Glasgow to find work—any work he could get with limited English. He got a job in an Italian restaurant in central Glasgow before I left the hostel, but moved on to London shortly thereafter. Then there were the countless young Australians in hostels throughout the U.K. who were officially or otherwise on “working holiday” gigs, serving as hostel staff a few hours a day in exchange for a bunk (and maybe meals). For the purpose of scouting future internships and jobs, as well as getting some work experience, that strategy can pay off handsomely—apart from whatever fun it offers. are trying out a job or internship, on a trial basis, e.g., probationary period. have completely given up trying to work and are willing and able to just get by on savings or even busking. On top of that, some hostels are really elegant and comfy. I call them “poshtels”. Others, well, even if you don’t have a job, you’ll have your work cut out for you trying to sleep, stay warm or otherwise meet your basic Maslow rock-bottom survival needs in some of them. Forget stereotyping all or most hostel denizens as drifters, lost, losers and party animals. Sure, there is no shortage of rowdy backpackers who think beer is a kind of wallpaper and that noise is a kind of language. However, in Kunming, China, the young woman who chatted with me on the sun deck of a budget hostel turned out to be a senior producer for MSNBC’s Rachel Maddow show and, before that, Keith Olbermann—taking a year off to see the world and get fresh perspectives. One Irish lad in the London hostel I stayed at was in town to attend to the details of collecting his Fulbright Fellowship. In an Edinburgh hostel I stayed at, one frazzled and angry young woman was dismayed that the corporation that had just hired her didn’t deliver on its housing promises, but relieved as well as resentful that she was staying in a hostel while hunting an apartment on her own. 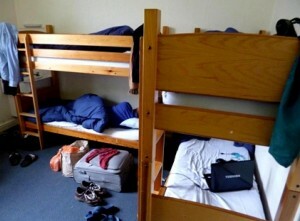 Then there were the neatly hanging suits and ties dangling from the upper bunk of dorm beds—evidence in some instances of a job started rather than merely sought. There was even what might be called an on-the-job “meta-hosteler”—the young, hip Canadian proprietor of a hostel in Mexico who was on a recon tour of hostels in the UK, for a hostel owner’s firsthand look at other hostels and their operations. Of particular interest to me during my travels was the apparent inverse correlation between recession bust in many other businesses and boom times in busy hostels, many packed even during the dead of winter in places with no ski slopes, but with lots of cold rain (and sometimes colder rooms). What I observed was how numerous so-called “long-term hostel residents” are—people who are not transient backpackers, instead settling into a hostel for the long haul, usually with a discount for long stays. They are usually more hopeful than those who end up in homeless shelters—another business that does great business when business is bad. I even got the impression that if economies remain sluggish or worsen, there could be spikes in hostel traffic, as the unemployed, the employment nomads and even the (nearly) homeless turn to hostels to meet both their job-search and housing needs. In response, many hostels may expand their already growing long-term resident programs, perhaps squeezing out, to some extent, the more recreational and leisured travelers and groups. In Cong, Ireland, at various points during my stay in a hostel there, the only other person onsite was a guest doubling as a caretaker, ensconced there indefinitely, under that kind of long-term resident arrangement. I did query management at a number of hostels in the U.K. and Ireland about the unusually high numbers of winter guests and broached my conjecture about the inverse relationship between a bad general economy and boomlets at hostels. Although increases in the numbers of long-term residents were noted, management generally seemed unsure about the strength of that correlation. My hunch, in accord with what I take to be common sense, is that as more people have to go farther afield to find work and burn through whatever funds they have, the multi-functionality of hostels as a kind of job central will make them ever more appealing. Having a cheap place to stay or even to work—while looking for work, recovering from loss of work or otherwise dealing with employment-related issues—can indeed be a very attractive proposition. As for networking, my own “data” and reports from many guys (including millennials) suggest job networking is probably likelier than social networking, since a disproportionately large number of hostel floppers (especially the females, the guys said and I noticed) are borderline hostile or at least markedly withdrawn. Perhaps their seemingly hostile attitudes (at variance with expected hostel attitudes) reflect jet lag, moonwalk-sized backpack fatigue or an instinctive human aversion to not only crowding, but also crowding with strangers in and at very close(d in) quarters. Still, there are enough pleasant exceptions to justify risking ending up with a bunch of misanthropic mutes as dorm mates. My own niche in the framework of hostel job central dorms (frequently and very happily occupied by only me, at the quieter ones) was that of an employed professional on quasi-assignment. When I told others I was a writer, almost all instinctively asked whether I am a “travel writer”, to which I replied, “Nope. Traveling writer.” To the extent that I was also holidaying, at times it could have been said that I was a dormant professional. Or should I say, given the milling and scurrying mobs in some of them, “dorm-ant”?